It’s no secret that SUVs and crossovers have become increasingly popular in recent years. Their utility and versatility have proven necessary to many drivers who may have otherwise chosen a pickup truck or minivan. Plus, with so many different sizes and types to choose from, drivers are able to find the crossover or SUV that meets their needs, whether they want better efficiency, more room for passengers or a stronger towing capacity. For a small, efficient model that still offers plenty of passenger and cargo space, shoppers can opt for a compact crossover. Drivers who require more space and power can turn to a larger SUV. And that’s just the beginning; shoppers can also explore the midsize or large crossover segments to find what model best suits them. 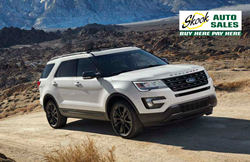 While brand-new SUVs may be outside the price range of many drivers, the pre-owned models in stock at Skook Auto Sales offer affordable, attainable price tags for a variety of shoppers. Not only are used crossovers and SUVs priced lower--they typically also have lower insurance and registration costs. Plus, the team at Skook Auto Sales is committed to working with individuals to find the vehicle and payment plan that fits their budget. To see the affordable used crossover and SUV models that are currently available at Skook Auto Sales, interested individuals can visit the dealership’s website at http://www.skookautosales.com. The dealership can also be reached by phone at 570-910-2254 or in person at 312 Centre Avenue in Schuylkill Haven.